Recently I answered several questions about Audio in Captivate. Maybe they can be useful for other Captivate users, decided to write this short blog. Although personally I mostly use Adobe Audition to record and edit audio clips for Captivate, this blog will focus only on the Audio features within Captivate. In the past I have posted several articles about audio. Some tweaks can be found in this one which I created with CP2017. Tips here were not yet published. For HMTL5 output audio (and video) has to be generated when entering a slide with audio. For long clips (to be avoided, better split up on more slides) that can take a while and could even lead to synchronizing problems. In the past (SWF output) I sometimes used Project audio, which was distributed over all the slides, using the Audtion roundtripping. This workflow should be avoided now, because that would mean that the full project audio has to be loaded on the first slide, which will lead to considerably long waiting time. When inserting slide audio, the slide timeline duration will be extended to the length of the audio timeline, when the audio duration is longer than the original slide duration. It will start on the first frame of the slide, and end on the last frame. As I read in forum questions like this it happens that the total number of audio clips seems to decrease. Reason is that Captivate ‘thinks’ that audio has been distributed over some slides, and merges those audio clips to one audio clip. This leads to a similar situation as with project audio: it takes a while before that longer clip is loaded and often synchronizing with appearance of slide items is screwed up. Here is a simple trick to avoid that merging: increase the slide duration a little bit, move the audio timeline on each slide, to have small gap before and after the audio. Merging will no longer occur. In this question user wanted to move a segment from one audio clip on a slide to another clip. Both were also slide audio, this trick will not work with other types of audio. 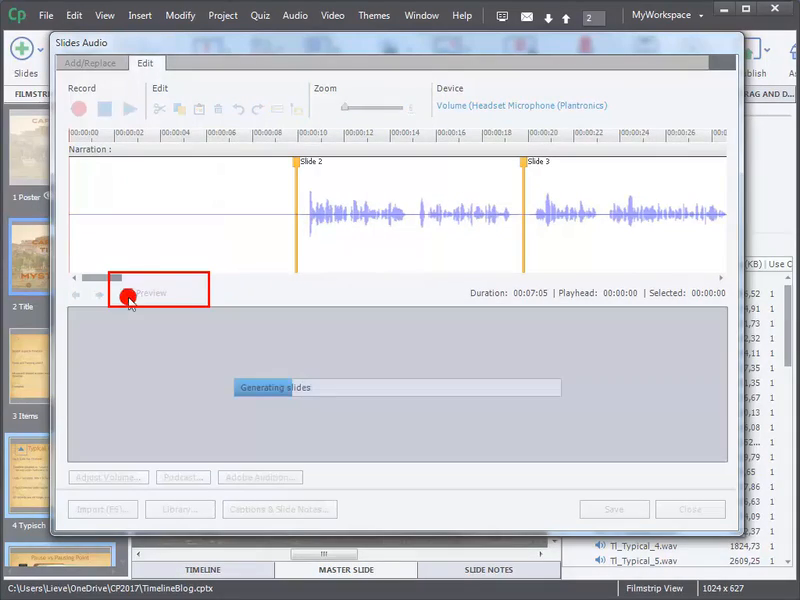 Opening an audio clip in the Editor, shows that you can select a segment, cut or copy it, then move the playhead and paste that segment in another location. However that is not possible between different audio clips. Drawback: as you’ll have seen in the video, Closed Captioning will be turned off and you’ll have to edit them to cope with changes in audio clips. Some short tips, related to the Library, which is one of my favorite features in Captivate. If you import audio, you choose best for the uncompressed WAV-format over MP3. Only wav files can be edited. If you want to edit an imported MP3-file, Captivate has to expand that file to create a WAV file. You will see 2 files with different format in the LibraryAudio folder in that case. Do not worry about size of the WAV files, when published all WAV files will be compressed by Captivate to MP3, and you can set up the compression parameters. When you edit an audio clip, the original clip will not disappear but a new clip will be generated. You can always get back to the original clip in the Library if something went wrong. Want to use TTS to create audio clips to be used as object audio or with the Play Audio command? When generating the audio clip from slide notes or sentences in the TTS dialog box, it will be automatically inserted as slide audio and the slide duration will be increased to match the clip. Since the audio clip will also be in the Library, find it using the right-click menu and eventually rename the clip to make it recognizable. You can safely delete the slide audio, reset the slide duration to its original length. Drag the audio clip from the Library to an object for Object Audio. Use it with the Play Audio command, which presents you with a list of Library clips. As explained in this blog all assets in any project library can be used as external library in other projects. This is also the case for audio files of course.